The cardiovascular side effects of older antidepressants and neurolepts are well known. These drugs inhibit the cardiac Na+, Ca2+, and K+ channels often leading to life-threatening arrhythmia. Selective serotonin receptor inhibitor antidepressants and new antipsychotics were introduced to overcome the toxicity of older generation drugs. These drugs have gained popularity owing to their fewer side-effect profiles. However, several case reports have revealed the arrhythmogenic effect of these drugs as well as orthostatic hypotension, especially in those receiving cardiac medications. 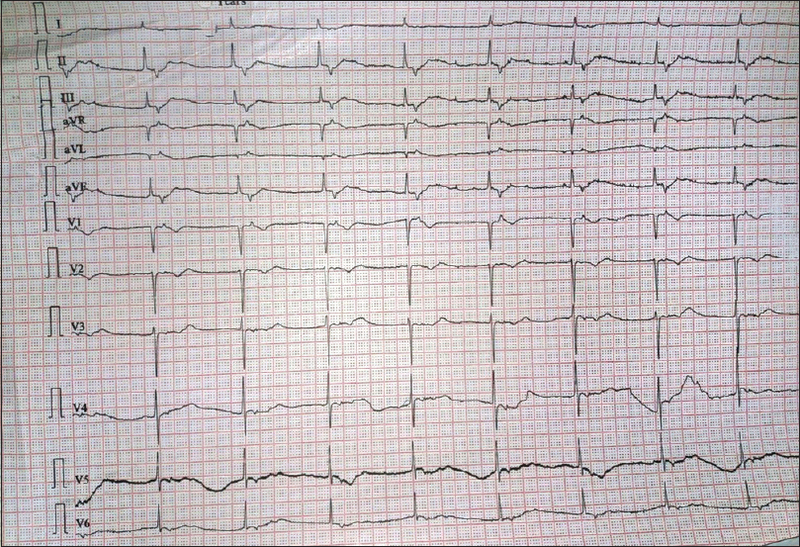 We report a case of a 65-year-old male who experienced junctional rhythm during the treatment of his acute manic episode with quetiapine and returned to normal sinus rhythm after discontinuing the medication. Quetiapine is currently the most commonly used second-generation antipsychotic for the treatment of dementia and psychological symptoms in the elderly. The sudden onset of cardiac abnormality is particularly considered a life-threatening side effect. Due to co-existing comorbidities (diabetes, hypertension, and cardiac disease), the elderly population is particularly prone to these effects. Quetiapine can cause QT interval prolongation and cardiac arrhythmias.,, The aim of this report is to highlight the cardiac effects of newer neurolepts and to discuss the mechanism therein. A 65-year-old male patient with the bipolar affective disorder was initiated on quetiapine for manic episodes. A routine examination by the treating physician revealed bradycardia and was therefore referred to us. The electrocardiogram (ECG) recording revealed junctional bradycardia. Serum chemistries and cardiac enzymes, including creatinine kinase, creatinine kinase-muscle/brain, and troponin-T were all within normal limits. Serial ECGs were obtained on a daily basis [Figure 1] and [Figure 2]. The newly-added medication was highly suspected as being the cause of this condition, and consequently, quetiapine was immediately stopped from the same day. Examination revealed a regular, slow pulse rate (50 bpm), and low blood pressure (90/60 mmHg) without orthostasis. The follow-up serum cardiac enzymes were all within normal limits, and the ECG continued to reveal junctional rhythm until 4 days after the event when it returned to normal sinus rhythm [Figure 3]. He was discharged with stable mental and cardiac conditions. We did not rechallenge with quetiapine to prove its effects because of the documented cardiovascular side effects of quetiapine. To our knowledge, this is the first Asian case of a quetiapine-induced junctional rhythm. Quetiapine is a selective antagonist with high affinity for dopaminergic (D2), serotoninergic (5-HT2A, 5-HT2C), histaminergic (H1), muscarinic (M1, M3), and adrenergic (α1, α2) receptors and a 5-HT1A receptor (partial) agonist. One hypothesis suggests that central administration of 5-HT can cause bradycardia or tachycardia and hypo- or hyper-tension mediated by activation of 5-HT1A and 5-HT2 receptors. Another hypothesis suggests that α1-adrenergic antagonism with peripheral vasodilatation causes postural hypotension and compensatory tachycardia. We believe that the lack of β-adrenergic affinity causes a sympatholytic effect that is exerted from the central instead of the peripheral system. Since quetiapine possesses α2-affinity, this receptor upregulation in the brain stem may induce bradycardia and hypotension at the same time. Although quetiapine is considered relatively safe in the elderly population, it should still be used discreetly, especially in those with concomitant cardiovascular diseases. Hence, QT interval should be assessed at baseline before the introduction of anti-psychotic medication and after initiation. Corrected QT interval should also be assessed after the occurrence of any factor that might influence the QT interval. We should avoid using quetiapine in combination with other drugs that may prolong the QT interval, including quinidine, procainamide, amiodarone, sotalol, other antipsychotic medications, and certain antibiotics. The authors certify that they have obtained the appropriate patient consent form. In the form the patient has given his consent for his images and other clinical information to be reported in the journal. The patient understands that his name and initial will not be published and due efforts will be made to conceal his identity, but anonymity cannot be guaranteed. Sajatovic M, Calabrese JR, Mullen J. Quetiapine for the treatment of bipolar mania in older adults. Bipolar Disord 2008;10:662-71. Janse A, Marijnissen RM. 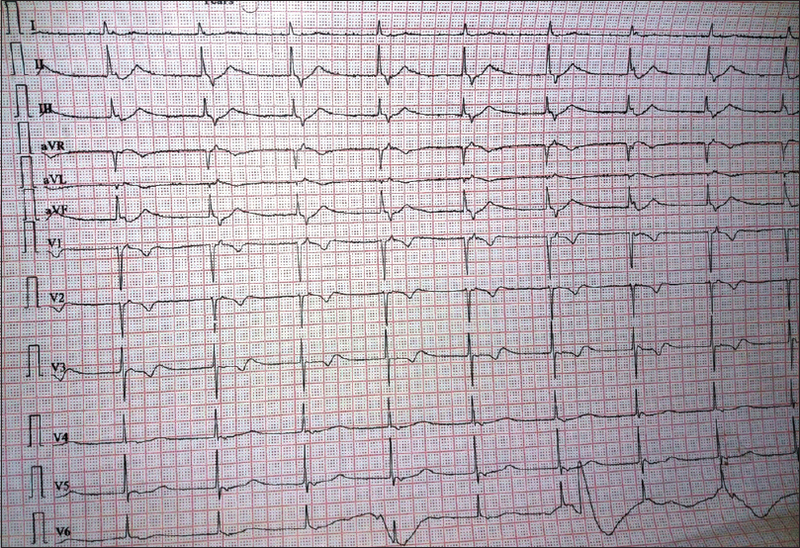 Quetiapine-induced bradycardia without QT interval prolongation in an elderly woman. Prim Care Companion J Clin Psychiatry 2009;11:172-3. Stöllberger C, Huber JO, Finsterer J. Antipsychotic drugs and QT prolongation. Int Clin Psychopharmacol 2005;20:243-51. Vieweg WV, Schneider RK, Wood MA. 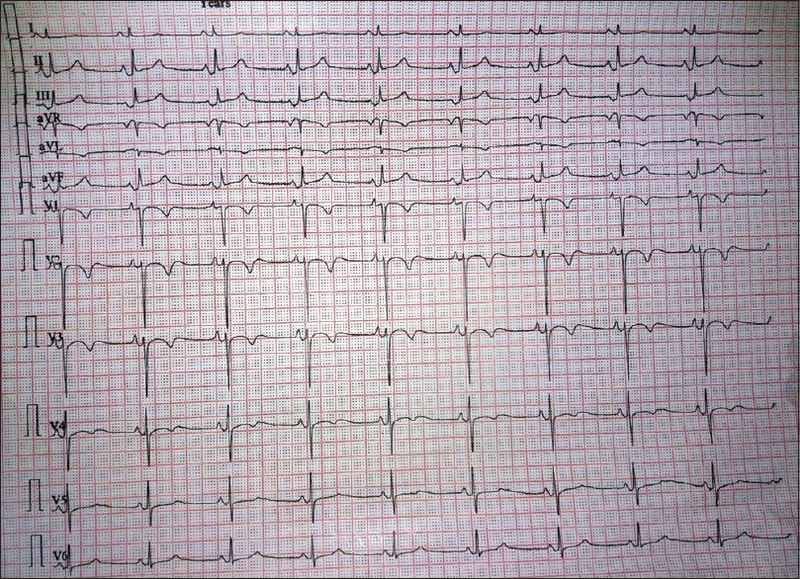 Torsade de pointes in a patient with complex medical and psychiatric conditions receiving low-dose quetiapine. Acta Psychiatr Scand 2005;112:318-22. Stahl SM. Essential Psychopharmacology. Antipsychotic Agents. 3rd ed. Cambridge: University Press; 2008. p. 327-451.